Beautiful, functional .223 ammunition with a great value add of ammo can, cloth bandoleers and stripper clips, this is a fantastic price point for such a high-end ammunition with so many extras. This 55 grain full metal jacket boat tail projectile works well with barrel twist rates of 1:8, 1:9 and 1:10, and can be used in other twist rates with success, just not as accurately. In these three rates you can expect MOA accuracy on this ammunition. For the money, it’s hard to beat the value of this case of .223 Ammo. The proven reliability and spectacular quality of the load makes it an easy choice, but the added bonuses make it a genuine bargain. 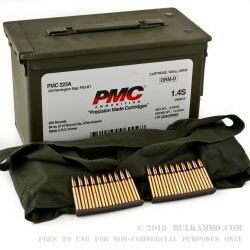 The PMC ammunition offers a very high specification for the load and with the reliability and accuracy as well as the reloadable brass (Boxer primer), it makes sense from a financial perspective. A nice velocity of 2900 feet per second and an energy delivery of 1250 at the muzzle means that you are getting great performance from a value price point and the functionality is flawless. 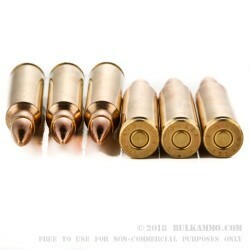 This ammunition is packaged for use in magazine fed firearms where the stripper clips will be of added value but the rounds can be shot in any .223 Remington firearm. 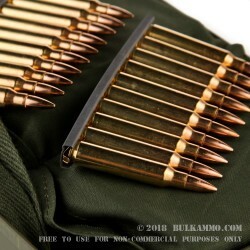 Q: Are these in standard .50 cal ammo cans? A: Hello Jared! 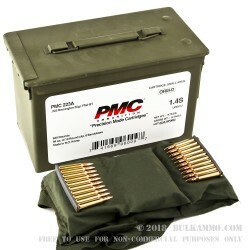 This PMC is packaged in standard .50 Cal ammo cans!